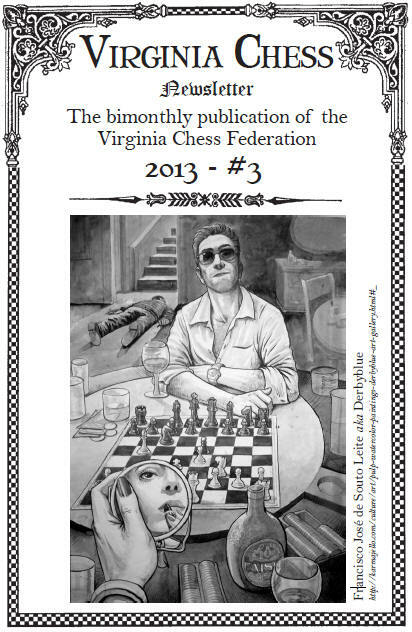 The Virginia Chess Newsletter is the official publication of the VCF. The bi-monthly issues are mailed to all VCF members with additional copies distributed at local and regional tournaments. A typical issue contains about twenty 8 1/2 x 11 pages chocked full of news, annotated games, book reviews, editorial comment and theoretical articles. The newsletter editor is FM Macon Shibut, a three-time VA State Champion and author of two chess books, Paul Morphy and the Evolution of Chess Theory and The U.S. Chess Hall of Fame. The newsletter serves three purposes: to provide a permanent record of state chess news and events; to facilitate communication among the VCF membership, including promotion of upcoming events; and to provide a forum for Virginia chess players who wish to add their own work to the body of chess literature. More generally, Virginia Chess does whatever it can to increase the pleasure chess players in the Old Dominion derive from the Royal Game. With these goals in mind the newsletter maintains a consciously parochial editorial outlook: it is for, by, or about chess in Virginia. Within the bounds of that criterion, just about anything is considered for publication. In the past we have offered our readers everything from typical tournament reports and games to such esoterica as John Campbell¹s 1994 article on a lithograph that hangs in a house in Fredricksburg and once drew the attention of Paul Morphy, or G. L. Honaker¹s 1998 exposition of a chess-based mathematical puzzle. Material for publication should be sent to the editor at editor@nospam_vachess.org (remove "nospam_" from the email address prior to sending) or regular mail (8234 Citadel Place, Vienna, VA 22180).